Celebrity chef Ken Hom, widely regarded as one the world’s greatest authorities on oriental cooking, is to receive an honorary doctorate from Oxford Brookes University on 12 September 2007 at 2pm in recognition of his ‘outstanding success within the international food world’. The ceremony takes place at Oxford Brookes University, Main Hall, Headington Campus, Gypsy Lane Site, Oxford. The honorary doctorate will be presented by the University’s Vice-Chancellor, Professor Janet Beer, after students of Brookes’ Business School’s Department of Hospitality, Leisure and Tourism Management (HLTM) receive their awards. Ken Hom has donated his library of over 2,000 text books on cookery and Asian culture collected over 30 years to the Department. He is also to be appointed as a Founding Patron of the Oxford Centre for Food Studies, soon to be established in the School. Oxford Brookes’ University stressed that the doctorate is being awarded to recognise Ken Hom as one of the world’s most notable chefs with a highly successful career in the media, as an entrepreneur and as a supporter of charity and education. Ken Hom comments: “I am honoured and humbled by this award. I have always been very keen to get to know the students and talk to them about what inspires them, the way Chinese cookery inspired me. I want to share my passion and love of food and Chinese culture, especially with eager students. I hope this awards will be helpful in this endeavour”. 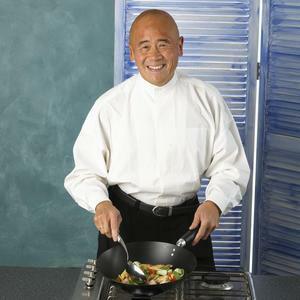 Ken Hom, 58, was born in Tucson, Arizona, where his Cantonese parents lived after emigrating to America in the 1930’s. Moving to Chicago, at the age of 11 he went to work in his uncle’s restaurant, where he earned the equivalent of 30 pence per day. At 20 he headed off to California and started to give cookery lessons to fund his university fees. He taught at the California Culinary Academy and then went on to write his first book about Chinese cookery techniques, which the New York Times praised as a seminal work. The article, spotted by BBC Television, led to several cookery series. His Ken Hom’s Chinese Cookery series in 1984 and the subsequent Travels with a Hot Wok series attracted millions of viewers throughout the world. Since then, he has sold over 4.7 million woks in Europe, and has written over 20 books including the classic Foolproof Chinese Cookery, considered by many the bible of Chinese cookery. To find out more, log on to Kenhom.com.